This part 2 in a 3-part series on Visio Divina. You can read part one here and part three here. We all long to hear God’s voice. Some believe that God finished speaking what He had to say with the end of the Bible. I happen to not agree with that viewpoint. Throughout the Bible, God spoke to His people in a myriad of ways. And Scripture says that God is the same yesterday, today, and forever (Hebrews 13:8, James 1:17). So, why would God stop speaking? But also remember that He doesn’t contradict Himself (Hebrews 6:18, Numbers 23:19). I strongly encourage you to check against Scripture anything you hear during your time with God and with the image you are praying with. If you are not sure, even after checking Scripture (1 Thessalonians 5:22, 2 Timothy 3:16, 1 John 4:1, Galatians 1:9), then speak to a pastoral person in your church. One practice before you begin any contemplative practice is to pray Ephesians 1:18 (“I pray that the eyes of your heart may be enlightened in order that you may know the hope to which he has called you, the riches of his glorious inheritance in his holy people,”) Psalm 19:14 (“May the words of my mouth and the meditation of my heart be pleasing in your sight my Rock and my Redeemer.”) and John 16:13 (“But when he, the Spirit of truth, comes, he will guide you into all the truth. He will not speak on his own; he will speak only what he hears, and he will tell you what is yet to come.”). God is the hearer and answerer of our prayers. We all have certain expectations of what we think God’s voice will sound like. Even Elijah did. And the sound of His voice or the way in which He speaks may surprise us. God meets us where we are and speaks to us in ways that we will understand. God knows our human limitations and our propensities and quirks since She created each one of us. She may speak to us through an impression or memory, through something someone says, through something that happens in the world outside of us. In Judges 6:36-40, God answered Gideon with a wet fleece… and then a dry fleece. See, God knows even our doubts. God longs to teach us and She longs for us to know the sound of Her voice (John 10:27). She longs to guide us, lead us, and teach us. Howard Zehr in his book Little Book of Contemplative Photography: Seeing With Wonder, Respect And Humility talks about how metaphors are related to our knowing. Our awareness of metaphor will inevitably deepen our experience. God speaks to us through color, texture, shape, memory, impression, our five senses, inner peace, the outside world. God is always speaking. We need to continue to pray that we hear Him and see Him as He reveals Himself to us through art or any other way He chooses to reveal Himself. 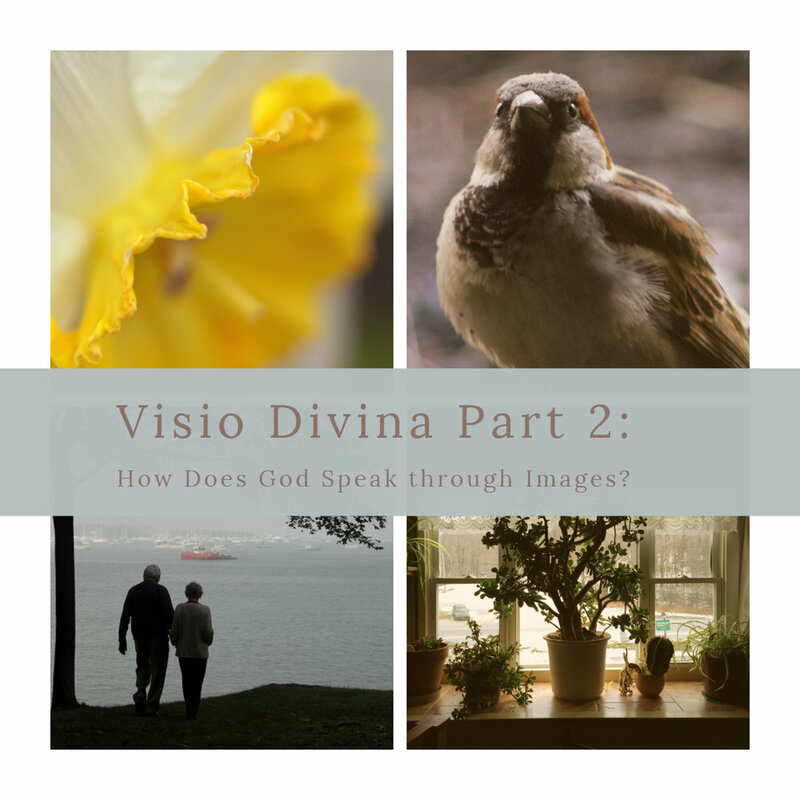 The contemplative practice of visio divina doesn’t have to stop with a photograph or painting or other piece of art. This awareness of God, this listening for His voice in our daily life, opens us to hear Him anywhere. I once had a dream that I was stepping over a piece of trash on the ground and (in the dream) God whispered in my ear: “This is holy ground.” I woke with a bit of a startle. Yes, that took me aback a bit. However, after many hours contemplating the dream and reading scripture I feel like I understand what God was telling me. Wherever we are is holy ground because we carry within us the Holy Spirit and wherever God is present, that place is holy. God can speak to us in a junk yard as plainly as He can speak to us sitting in a pew at church. Nothing at all can separate us from God or God’s love – neither death nor life, neither angels nor principalities, neither the present nor the future, nor any powers, neither height nor depth, nor anything else in all creation (including a piece of trash!). Romans 8:38-39. Below is a list of scriptures that I encourage you to look up as you embark into this practice. My prayer is that you will learn to hear the voice of God in all the ways He speaks as you go through your daily life. Visio Divina is one of many different spiritual practices that will help you to learn to slow down and really listen.